United Nations (UN) Numbers are four-digit numbers used world-wide in international commerce and transportation to identify hazardous chemicals or classes of hazardous materials. These numbers generally range between 0000 and 3500 and are ideally preceded by the letters "UN" (for example, "UN1005") to avoid confusion with other number codes. North American (NA) Numbers are identical to UN numbers. If a material does not have a UN number, it may be assigned an NA number; these are usually 4-digit numbers starting with 8 or 9 such as 9037 (or ideally, NA9037), the NA number for hexachloroethane. UN/NA numbers are required for the shipment of hazardous materials. You have probably seen placards (such as the one on the right) that bear a UN/NA number on railway cars, trucks, shipping containers etc. UN numbers are assigned by a committee of the United Nations, the Economic and Social Council (ECOSOC) Committee of Experts (COE) on the Transport of Dangerous Goods which issues "Recommendations on the Transport of Dangerous Goods" (also called "the Orange Book"). UN Recommendations are not regulations, but are recommendations addressing the international transport of dangerous goods by sea, air, road, rail and inland waterways. These recommendations are reviewed, amended and updated biennially (every second year) by the UN COE and are distributed to nations throughout the world. These recommendations serve as the basis for national, regional, and international transport regulations such as those prepared by the International Maritime Organization (IMO) and the International Civil Aviation Organization (ICAO). The UN Recommendations are also used as a basis for the development of regional (e.g., NAFTA and European Road and Rail regulations) and national transport regulations, including the U.S. Hazardous Materials Regulations (see our entry on DOT). A list of the most commonly carried dangerous goods, their identification and their classification. Consignment procedures such as labelling, marking, and transport documents. Standards for packaging, test procedures, and certification. Standards for multimodal tank-containers, test procedures and certification. "2000 Emergency Response Guidebook: A Guidebook for First Responders During the Initial Phase of a Dangerous Goods/Hazardous Materials Incident", Paperback. Estimated price $8.00. Info and/or order. "Recommendations on the Transport of Dangerous Goods: Model Regulations (Recommendations on the Transport of Dangerous Goods: Model Regulations, 16th)", Paperback, 2009. Estimated price $155.00. Info and/or order. UN numbers uniquely identify only a very small number of chemicals or families of chemicals (less than 10,000), unlike CAS Registry Numbers, which are assigned to each of the 50,000,000 unique chemical compounds that have been discovered. UN/NA numbers are very useful for shippers and emergency first-responders, but are not particularly applicable to employees occupationally exposed to the materials. Label your chemicals correctly using posters, labels and supplies from Safety Emporium. 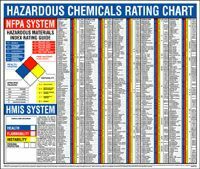 UN/NA numbers are not required by OSHA on an MSDS, although many sheets have them to simplify shipping requirements. DOT's 2008 Emergency Response Guide Book is indexed by "ID Numbers" which are actually the UN/NA number. Be careful not to confuse the ID number (UN/NA number) with the Guide number (the page that tells you about the properties and hazards). For example, the UN/NA number for ammonia is 1005, but the hazards are discussed in Guide entry 125. The Guide is a free download and is on-line searchable. Ideally, a hard copy of the Guide should be every kept on any vehicle, train, boat or aircraft that transports hazardous materials as well as every emergency rescue vehicle. See above under Books about purchasing a hard copy. 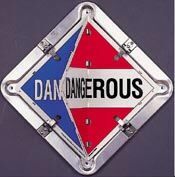 Download the List of Hazardous Materials from the U.S. Department of Transportation web site. This Excel spreadsheet file contains proper shipping names, UN numbers and more for almost 3,500 entries ranging from "acetal" to "zirconium". DOT also has a some good links to information on The United Nations Recommendations on the Transport of Dangerous Goods. See also: CAS number, EINECS number, The MSDS FAQ, Labeling provisions of the OSHA Hazard Communication Standard.